Invasion von Influenzaviren (IV) und/oder Staphylococcus aureus in Zellen von epithelialen und endothelialen Barrieren führt zur Aktivierung der Raf/MEK/ERK Kinasekaskade. Es wurde gezeigt, dass aktive ERK den nuklearen Export von IV Genomen befördert und somit die virale Replikation unterstützt. Der detaillierte Mechanismus wird nun weiter aufgeklärt. Außerdem wird die Regulation und Funktion des ERK-Signalwegs nach IV und/oder S. aureus-Infektion hinsichtlich Immunreaktionen, Entzündung und Pathogenlast untersucht. Schließlich wird die Eignung des Signalwegs als therapeutischer Angriffspunkt evaluiert. Börgeling Y, Rozhdestvensky TS, Schmolke M, Resa-Infante P, Robeck T, Randau G, Wolff T, Gabriel G, Brosius J, Ludwig S (2015) Evidence for a novel mechanism of influenza virus-induced type I interferon expression by a defective RNA-encoded protein. PLoS Pathog 11: e1004924. Börgeling Y, Schmolke M, Viemann D, Nordhoff C, Roth J, Ludwig S (2014) Inhibition of p38 mitogen-activated protein kinase impairs influenza virus-induced primary and secondary host gene responses and protects mice from lethal H5N1 infection. J Biol Chem 289(1): 13-27. Dierkes R, Warnking K, Liedmann S, Seyer R, Ludwig S, Ehrhardt C (2014) The Rac1 inhibitor NSC23766 exerts anti-influenza virus properties by affecting the viral polymerase complex activity. PloS One 9: e88520. Köther K, Nordhoff C, Masemann D, Varga G, Bream JH, Gaestel M, Wixler V, Ludwig S (2014) MAPKAP kinase 3 suppresses Ifng gene expression and attenuates NK cell cytotoxicity and Th1 CD4 T-cell development upon influenza A virus infection. FASEB J 28: 4235-4246. Liedmann S, Hrincius ER, Anhlan D, McCullers JA, Ludwig S, Ehrhardt C (2014) New virulence determinants contribute to the enhanced immune response and reduced virulence of an influenza A virus A/PR8/34 variant. J Infect Dis 209: 532-541. Liedmann S, Hrincius ER, Guy C, Anhlan D, Dierkes R, Carter R, Wu G, Staeheli P, Green DR, Wolff T, McCullers JA, Ludwig S, Ehrhardt C (2014) Viral suppressors of the RIG-I-mediated interferon response are pre-packaged in influenza virions. Nature Comm 5: 5645. 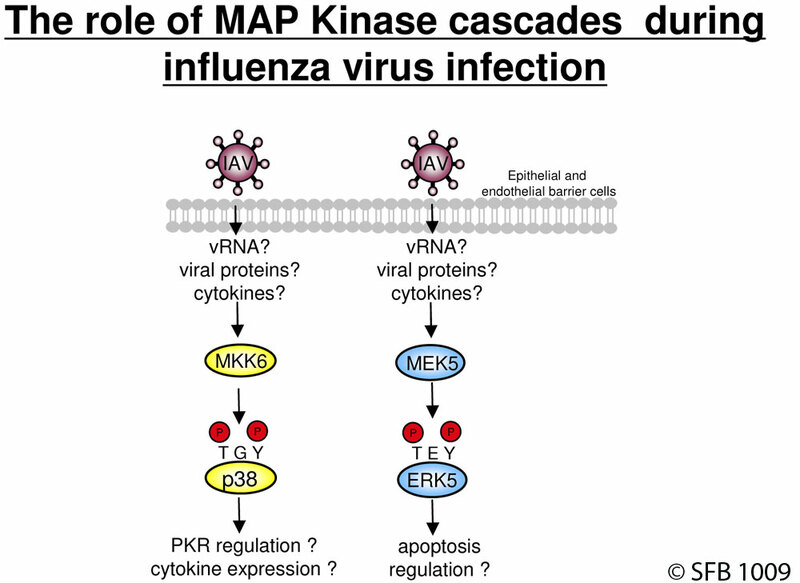 Nacken W, Anhlan D, Hrincius ER, Mostafa A, Wolff T, Sadewasser A, Pleschka S, Ehrhardt C, Ludwig S (2014) Activation of c-jun N-terminal kinase upon Influenza A Virus (IAV) infection is independent of pathogen related receptors, but dependent on amino acid sequence variations of the IAV NS1. J Virol 88: 8843-8852. Warnking K, Klemm C, Löffler B, Niemann S, van Krüchten A, Peters G, Ludwig S, Ehrhardt C (2014). Super-infection with Staphylococcus aureus inhibits influenza virus-induced type I IFN signalling through impaired STAT1-STAT2 dimerization. Cell Microbiol (in press). [ doi: 10.1111/cmi.12375. Epub ahead of print]. 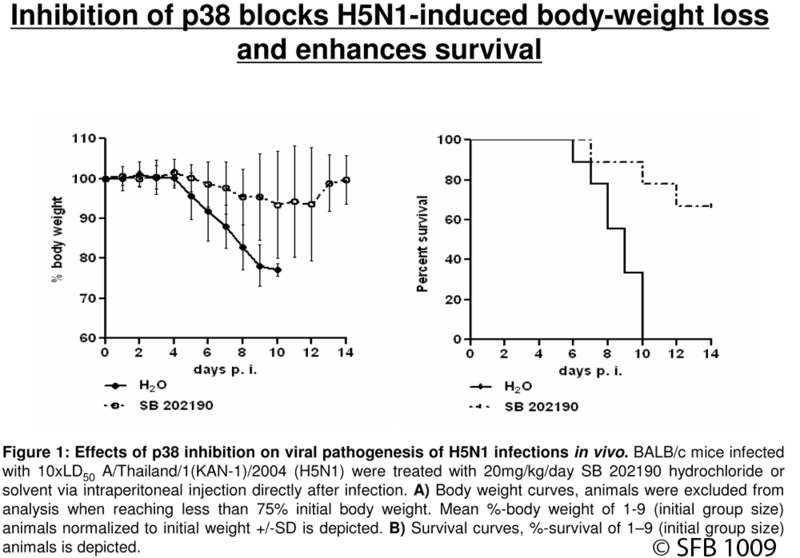 Nacken W, Ehrhardt C, Ludwig S (2012) Small molecule inhibitors of the c-Jun N-terminal kinase (JNK) possess antiviral activity against highly pathogenic avian and human pandemic influenza A viruses. Biol Chem 393: 525-534.